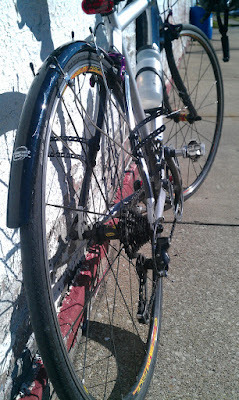 FSA SL-K carbon crankset (53/39) — soon to be replaced saved by Loctite Red! Curb weight: 19 pounds, 10 ounces. This badgeless beauty was my 2010 Christmas present from DD, and was built up with loving care by the crew at Couriers’ Bike Depot on Market Street in Louisville. Looks tough, but handles like a dream. Hydrargyrum, decked out for winter. The Tenacious Tricross was purchased for one primary reason — gravel racing — but will pull quadruple-duty as gravel racer, commuter, touring bike, and ‘cross racer. It has now amply proven its capability both on the commute and on the gravel parcours — Team River City Cycling Society finished in the top half at this year’s Sub-9 Gravel Grovel, blowing last year’s DNF right out of the water! This is a solid, solid all-around machine. It has lovely road manners and, unlike its gravel-racing predecessor (my old Motobecane Fantom X, which moved to Lexington and got stolen), it really shines on the descents (thanks in part to the disc brakes). In short, it’s light, stiff, and corners like it’s on rails. Fit-wise, it’s as comfortable as the Fearsome Fuji, but a bit more relaxed. I have found myself pleasantly surprised with Specialized’s Riva+ saddle, and I have no complains about the light-but-stiff, rock-solid, fast-rolling Specialized Axis wheelset. Denis bought the tandem as a birthday gift to himself (and, obviously, also to me). It’s not light, it’s not fast — but it’s cushy and comfy and fun. …Because every stable needs a big, heavy, folding, fully-rigid (even though it folds), steel mountain bike. “Behemoth” weighs something like sixty pounds. This is one solid hoss of a bike. Nonetheless, it’s a fun little ride, though I have trouble feeling right on a bike with flat pedals at this point in my life. It’s also unkillable. The Bike is a Fuji from the 1990s. Ironically, the only way to get one of this particular model was to smoke enough Marlboros to kill an elephant (or, as Denis did, collect Marlboro Miles from everyone within a twenty-mile radius, plus any you found on the ground). Fortunately, it’s solid enough to equip with a custom oxygen-tank rack. This bike — an actual mountain bike! OMG! — completes the herd for now. A 29er with nice road manners and very nice off-road manners, it offers a lot of potential as a long-term bike. If I somehow blossom into a Srs Mtn Bike D00d, I can lighten it up with a few upgrades and pwn the trailz. If I don’t, I’ll just leave it as it is and it will continue to operate as a fun-on-the-trails bike, a backup commuter, and a backup gravel racer. Because I bought it on end-of-year clearance, I got a rather nice deal on this bike, and I lucked into the orange-and-black color that I wanted but thought was out of stock. 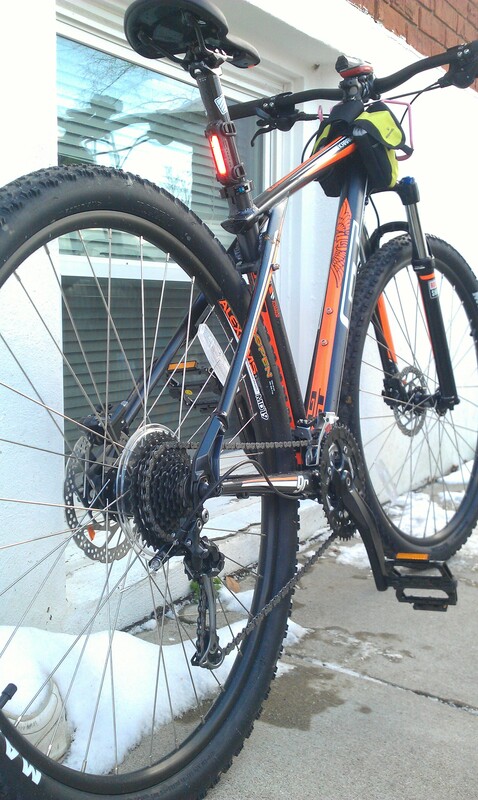 The Mountain Monster has taught me about the beauty of big, fat tires and hydraulic disk brakes. Man, is this bike ever stoppy! My lord, you should see our garage. Both my men have downhill and all-mountain bikes. I have an all-mountain bike. 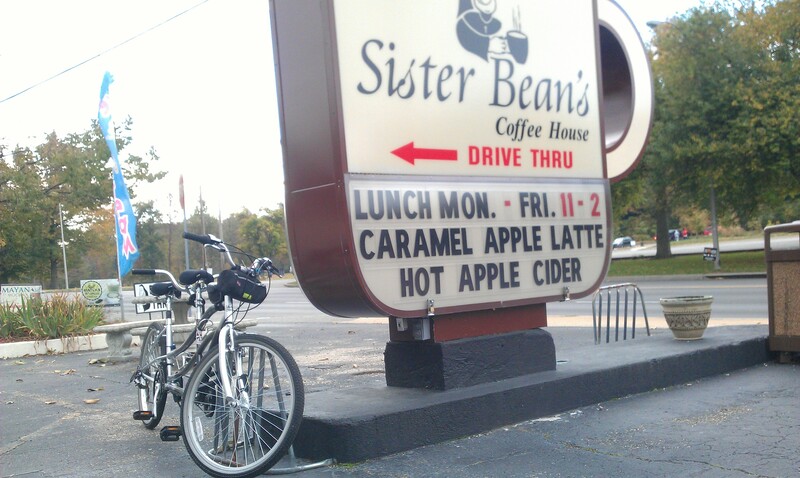 My husband has a road bike he’s borrowing from his brother. We are probably due for more road bikes, but speed limits on streets around here are 45-50 mph (drivers go 60) making it extremely dangerous to ride on the roads – not that DH MTB is safe. Obviously, I’m not the enthusiast, as I cannot rattle off the names and specs of the bikes. Just wish that my son still road all-mountain so that I could join him, taking the easy paths as he went off onto the advanced ones. For DH MTB, I act as chauffeur driving heavy DH bikes back uphill. When they ride at converted ski resorts in the summer, I get a reprieve from hauling bikes. I hear you — there are definitely some roads around here that really aren’t great for riding! It sounds like your garage is suffering from a case of “n+1” — the cyclist’s bike acquisition rule 😀 (In short, the correct number of bikes to own is n+1, where n=the number you currently have!) I’m convinced that, like wire hangers, bikes reproduce when we’re not looking. I’ve heard of the n+ equation. Yes, we do have that problem. At least I got my husband to sell the MX’s since we no longer live in the Mojave Desert.